These are beautiful ristras, but they are shiny from lacquer, so you can look but don’t eat! Some say it with pineapples, some say it with horseshoes; New Mexico says it with ristras. When I first moved to Santa Fe, NM for graduate school almost 15 years ago, I was dazzled by the open sky. The way the blue sky met the brown horizon with nothing but gradations of those two colors as far as the eye could see just blew my mind. Every time I looked up at the sky those first few weeks I got a mild case of the spins. Later I realized it was probably the high altitude scrambling my senses, but that first hot Southwestern summer I was soaking in cotton-tufted blue skies, afternoon rain storms, and ristras. 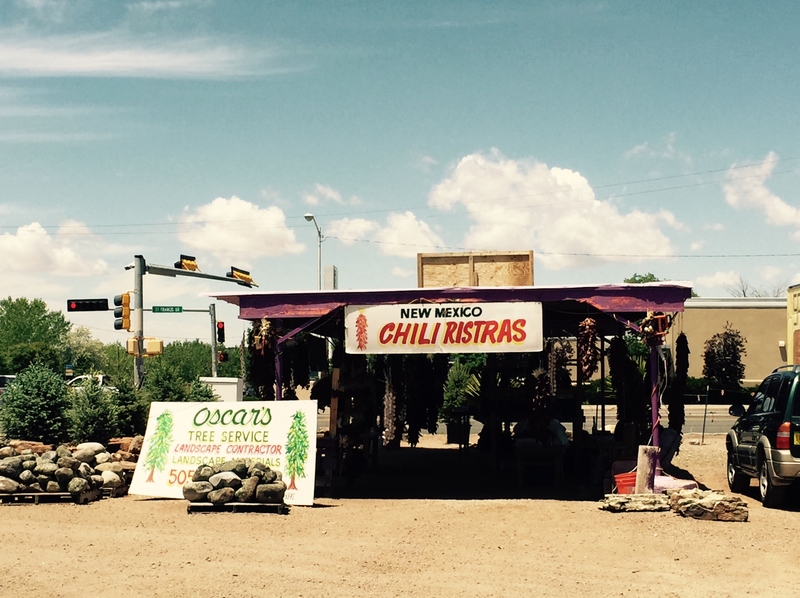 Ristras, dried chili pods strung into clusters, are New Mexico’s archetypal welcome mat. Traditionally, ristras were practical objects: stringing chili pepper pods into a ristra was a means of drying the pods while keeping them intact and ready for culinary use. They are still used this way today, but their iconography equals, if not exceeds, their practicality since it extends to New Mexicans and visitors alike. 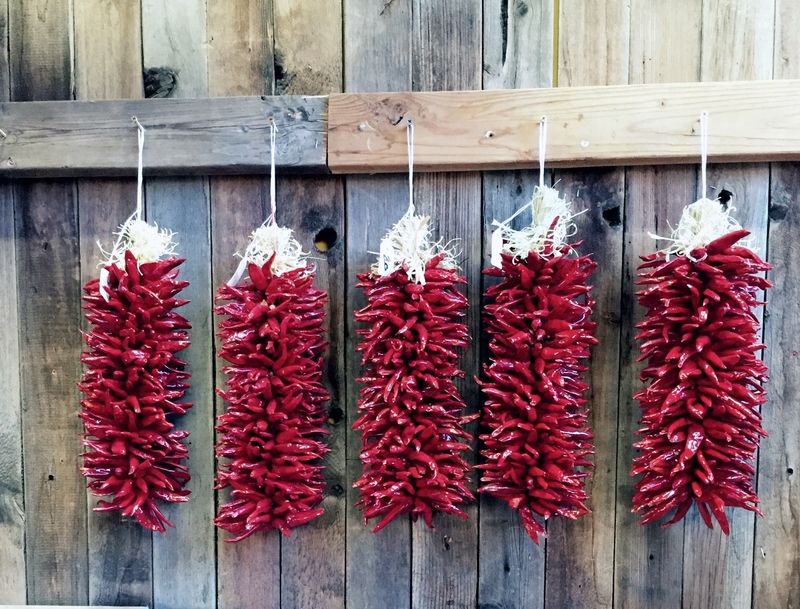 Chili ristras are an integral piece of New Mexico’s rhythm and personality. A view from the peaceful Randall Davey Audubon Center and Sanctuary in Santa Fe, NM. Chilis are life in New Mexico and my memories of New Mexico seem to sync up with chili cycles. Chilis are harvested in late summer, so beginning around late August chili roasting kettles are in front of most grocery stores, farmers markets, and roadside stands. Everything smells like pinon and roasting green chili into autumn. The idea is to roast enough green chilis (by the pound or by the bushel) to last through the rest of the year. For red chili, you’ve got the ever-functional ristra supplying your fix. Ristras also double as decoration because, come summer, when everything is baking under the hot, high desert sun, ristras lend their rich, red color to the brown landscape and adobe walls. To me, they are innately beautiful in their simplicity. I hadn’t been back to New Mexico since I left in 2012 when a chance suddenly came together this summer to travel there for an alumni event. Suddenly, all I could think about were ristras. Chilis hanging from doorways of homes and businesses is a common sight in New Mexico. For some reason, I couldn’t wait to see them and photograph them and take a bunch home with me. I wanted ristras hanging from my porch and gracing my kitchen. I’m not sure why, but I needed them. 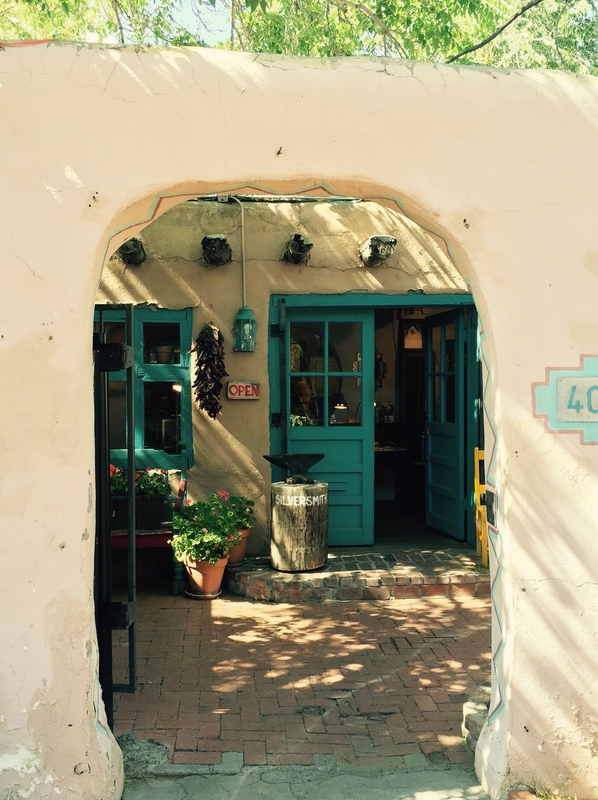 When we got to Santa Fe in June, I became virtually obsessed with photographing ristras. The funny thing is, once you’ve photographed one, you’ve kind of photographed them all — they all look the same. Still, I took dozens of stills and videos trying to capture the quiet profundity of the ristra welcome. I don’t know why ristras were so inspiring to me this summer, but I spent an inordinate amount of time running around in my rental car trying to find ristras to take home to family and friends. Ironically, summer is not a great time to find ristras — or, at least it wasn’t this summer as my search turned up oddly short time and time again. Supplies were slim since the next harvest was only a few months away. Look for ristras in October and the state will be flush with dried chili pepper strands again. I found this roadside stand on my way out of town after I had already scrounged up and packed my ristras into suitcases, but my friend bought some great ristras here to carry on to the plane with her. I did finally manage to find a ristra source; some were a bit scraggly and I had to settle for a few lacquered ones to round out my collection (my preference was for natural, un-lacquered ristras so one could actually use them in cooking if one wanted), but it was the best I could do in my short time there and I was happy to have found them at all. I bought more ristras that trip than I did the whole time I lived in New Mexico all those years ago. My friends and family were probably a little surprised and confused when they received ristras in the mail, but it helped quench my thirst for whatever it was ristras were working on my psyche at the time. I had enjoyed my time in New Mexico the first time around but hadn’t ever really looked back once I left. 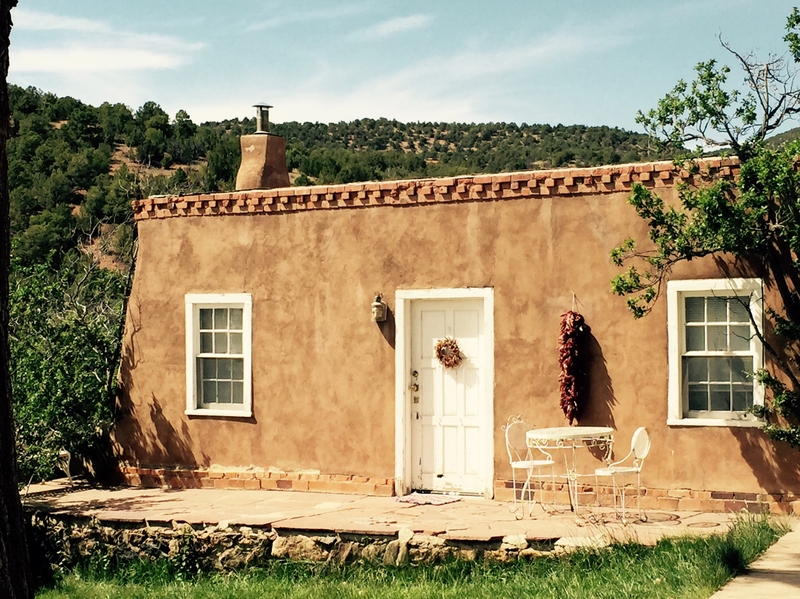 Somehow, this summer, traveling to Santa Fe for just those few days felt a little bit like going home. Little Guy ready for service. Now that I am back in Sacramento, where the sun blazes hotly in its Californian way, I’ve got my “outside” ristra (the large one) hanging incongruously on my front porch. It doesn’t fit in here, but I like it. It’s a transplant — a New Mexican welcome in my new town. And my little guy is waiting for me by my kitchen sink — a little beat up from the airplane ride home, but ready for duty. Roasting some peppers at home to get my chili fix. The long pepper in the back is a green chili that turned red since it took me so long to use it. The pepper in the foreground is a jalapeno.